Our story is in Lymphline Newsletter! When I came home from work a few days ago I was very excited to find the Spring edition of Lymphline Newsletter had arrived! I always look forward to getting it and reading about the latest research into Lymphoedema and the various personal stories – but this issue was particularly special as it included our family’s story along with a gorgeous photo of Max and Lucia. 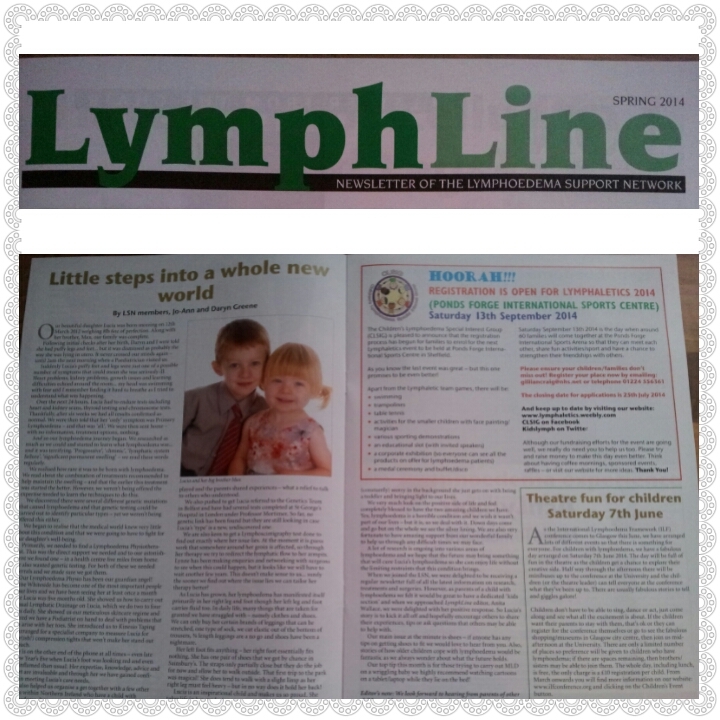 Lymphline is the quarterly newsletter sent out to members of the fantastic Lymphoedema Support Network (LSN) based in the UK. The LSN offer an amazing wealth of information about the condition and when you become a member you are sent out a brilliant range of leaflets and fact sheets that are regularly updated. We received a brilliant pack full of information specifically for children which was the first time we had got our hands on something that was tailored for us – and as you can imagine we read every word. Just before Christmas I contacted the editor of Lymphline, Anita Wallace, to see if there was the possibility of starting a ‘Kid’s Corner’ in each addition for parents like us and her response was fantastic! She asked me to start the ball rolling with Lucia’s story – so we did! I really enjoyed writing the article – the main part of my job is writing – so to have been able to write about something so important to me was very therapeutic and was actually what inspired me to start this blog, so thanks to Lymphline for that! How exciting… Will share on FB as always … LSN is a great support for everyone… Hope your week is going well .. At last the weather is getting cooler here in Australia which is much appreciated by us Lymphedema people!!! Hi I enjoyed reading your story in LSN my daughter was featured a year of so ago. She also has Lymphoedema in both lowers limbs and feet. I responded to your request for info on shoes and attached a link. Anita got back to me straight away to ask if she could publish my response in the next edition. Are you also aware Lucia is entitled to DLA my health visitor pointed me in the right direction for this. Hi Heather, thanks so much for this info! Definitely glad to have the info now and can’t wait to look at Lelli Kellies! I completely understand the tears in the shoe shop…it is the relief and happiness that something fits and they can get outside and enjoy life like all the other kids. Great idea for the cobblers too – we have a local one that would probably be able to do that sort of thing, another option we didn’t have before. How old is your daughter? Does she wear compression tights? I’d be interested in chatting if you wanted to drop me an email sometime as you are a few steps ahead of us and your experiences are priceless.